As it turns out, Mario Draghi is no stranger to blanket promises. In October 2008 as head of the Bank of Italy, Draghi joined Italian Finance Minister Giulio Tremonti in promising “as much as necessary” for Italian banks via a 5-year government guarantee of their bonds. The government standby would be available all the way through the end of 2009, giving Italian banks sufficient time and financial cover, it was thought, to get control in their own balance sheets. On the monetary side, Draghi’s central bank added €40 billion in Italian government bills for use in bank refis against failed collateral for eurosystem liquidity; a telling sum as to the scale of Italian banking missteps. Suffice to say, it didn’t work. Not quite four years later, Italian banks were again in a lot of trouble. Joined by their “southern” cousins around the PIIGS part of Europe, the threat was judged universally to be existential to the euro. 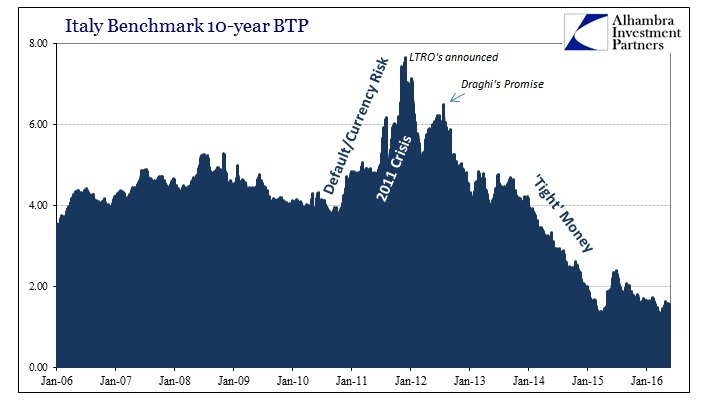 Despite the massive “money printing” of the LTRO’s earlier in 2012, it still seemed as if Europe was destined for a monetary-themed breakup. And so Draghi made another blanket promise. To the extent that the size of the sovereign premia (borrowing costs) hamper the functioning of the monetary policy transmission channels, they come within our mandate. In other words, to save the euro the ECB would do whatever it takes to bring down interest rates all over Europe so that transmission channels would open and full and healthy recovery would begin. It was always full-throated recovery that would permanently hold together the currency union. There can be no doubt as to success in the first part of that equation; bond yields all through Europe are lower now than they have ever been. But that is the problem even if the media and indeed policymakers don’t know it, or at least will not admit it. Draghi did the bulk of it. It’s pretty clear that the ECB has been decisive in alleviating the European situation. In the context of 2016, these are pretty damning statements. What did they actually do? It is an article of orthodox faith that low interest rates mean “stimulus” and success, but history is proving yet again otherwise. Though it had been under criticism for not taking to full-blown QE fast enough, in reality the ECB has been in almost constant motion. Whether in accommodation via liquidity, or in unused promises like Draghi’s July 2012 declaration, the ECB was never short of busy. Yet, the effects of all that busyness stopped far short of its full achievement. There is the clear interest rate effect, but then nothing. 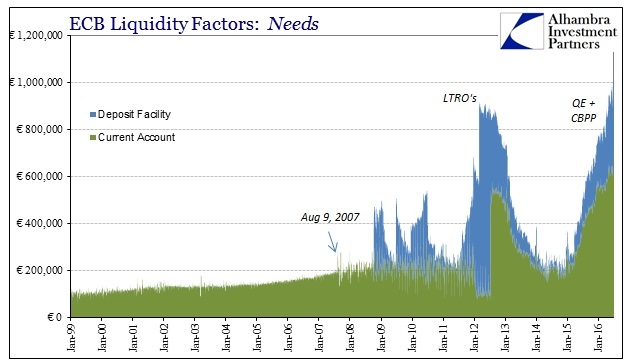 The chart immediately above isn’t a completely accurate statement of “liquidity” per se, but it does offer a sufficient representation of the ECB’s level of activity in banking and bank reserves. What you’ll notice is that sovereign interest rates weren’t very much affected by the first two groupings, the 2008-10 activity and then the LTRO’s; though the initial decline in rates did begin coincident to the announcement of the LTRO’s in late 2011. 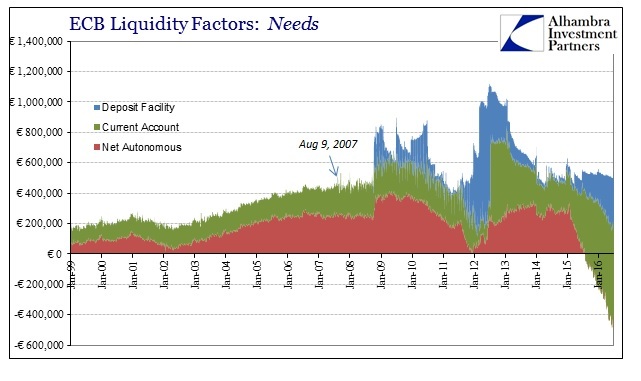 There was an initial positive response but then throughout the rest of the first half of 2012 another threatening backup in rates occurred despite all the “liquidity.” It wasn’t until Draghi’s promise that sovereign benchmark yields began their multi-year descent in Italy and elsewhere. In the context of that promise, it was all taken as “stimulus” when that may never have been the case. Draghi, at best, might have removed the default risk of Italy or even the greater risk of the euro’s breakup, but that wasn’t the same as “stimulus” in monetary terms as implied within his promise. The “tight money” regime that followed stands in sharp contrast to the ECB’s activities (including what all flows over to the NCB’s in QE). This is easily observed by the behavior and size of the Italian banks themselves. 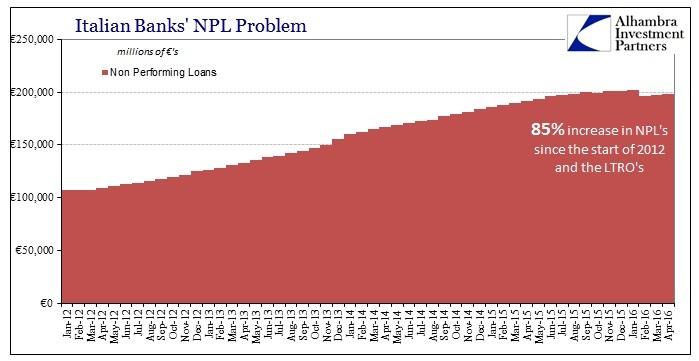 Bank balance sheets here bear no resemblance to monetary policy, including the expansion in the size and depth of Italy’s mammoth NPL problem. In July 2012, the total assets reported by the combined Italian banking system were €3.54 trillion. In April 2016, the latest data available, total assets were €3.48 trillion. 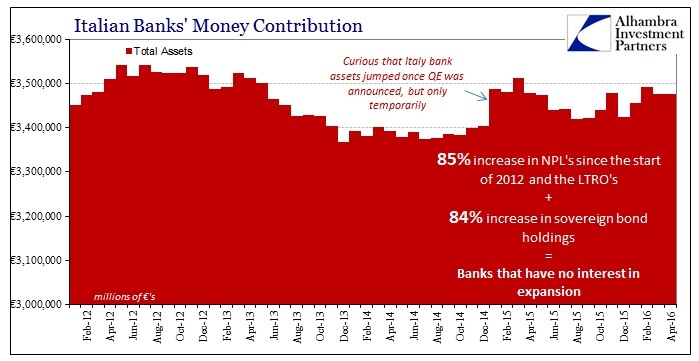 Worse for Draghi, of those assets, Italian banks have nearly doubled their holdings of government securities. In other words, the ECB through his promise did not actually encourage monetary expansion into credit expansion but rather front-running into government debt at the expense of total lending. The reason for that is obvious; with Draghi’s promise in their pocket, Italian banks as banks all over Europe found an outlet for “risk free” profit in buying government bonds at huge discounts. It was not an economic consideration. The mechanism for making good on Draghi’s promise was, in essence, a (deeply) negative factor on the further expected monetary transmission! 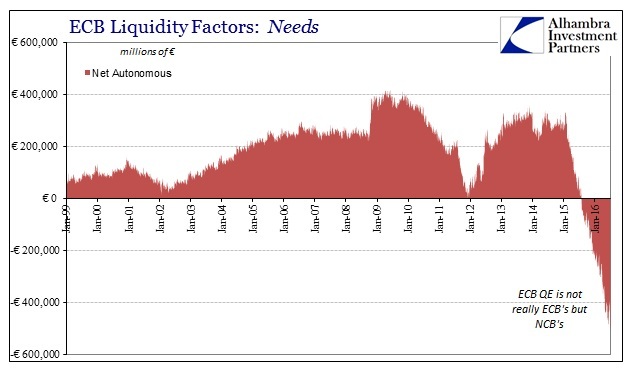 Once again we find this dichotomy between what the ECB classifies as liquidity expansion and the lack of true money expansion in the real economy. The interest rate fallacy holds; lower rates are accompanied by visibly “tight” banking/money conditions regardless of the level, acceleration or promises for ECB activity. Orthodox economics takes so much of itself on faith alone that it cannot distinguish negative signals from its own self-delusions. Draghi congratulated himself on a job well done without ever considering whether that was actually the case, or what was actually happening. He took low rates as if they were the foregone conclusion of all his blustery magic. Instead, no matter how high the ECB piles its various connected balance sheet factors, the real economy never responds. 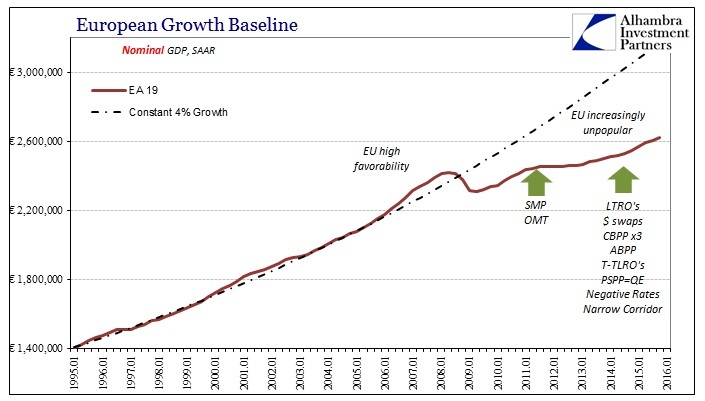 The most charitable economic description is that Europe has experienced an absence of further recession so far, but given the trillions spent intent on something far better than that it adds up to a colossal failure. For almost eight years, Italy has been saying that it is going to fix its banks; Draghi included in all those promises. Four years ago, the end of the threat to the euro was taken as proof nothing more was necessary. Yet, here we are all over again with Italian banks plastered as headlines all over the world for all the same wrong reasons. Nothing ever changes no matter how big or in what monetary form. And it is the very same failure that we find all over the world. There is no money in monetary policy, but central bankers still don’t seem to realize what they are missing. 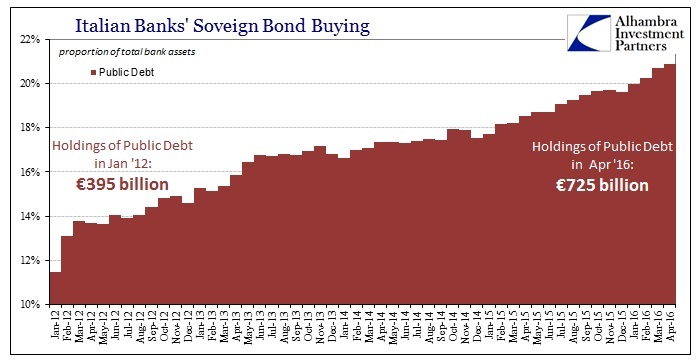 The economy, however, sure does; a fact that bond markets have been increasingly pricing.